The indicator shows the quantity of municipal waste per capita in Slovenia and compares it with the average in the EU. Municipal waste is defined as waste from households and other waste which is by its nature and composition similar to household waste. The Environment Protection Act (Official Gazette of the Republic of Slovenia, nos. 41/04, 17/06, 20/06, 28/06, 70/08) defines municipal waste management (collection and transport) as an obligatory local public service of environmental protection. To reduce the quantities of waste by connecting producers’ and users’ behaviour patterns and habits, ways of life, technological improvements, economic activities and measures, and demographic changes. According to the Environmental Agency of the Republic of Slovenia, approximately 400 kg of municipal waste is generated annually per capita in Slovenia. According to the Statistical Office of the Republic of Slovenia data, the generation of municipal waste was somewhat higher in 1995 and 1998 (515 and 523 kg per capita per annum). However, the methodology for collecting data on waste generated was slightly different, so it would be difficult to conclude that the quantity of waste generated had fallen. According to the 2002 data, 411 kg of municipal waste per capita was generated in Slovenia. In 2003, 786,608 tonnes were generated, which amounts to approximately 402 kg of waste per capita per annum. This waste was collected by local public service of municipal waste collection and transport. In 2004, 792,046 tonnes of waste (i.e. 403 kg per capita) were generated, and in 2005, 792,064 tonnes (i.e. 398 kg per capita). Due to different methodologies, the data from the Statistical Office of the Republic of Slovenia differ from the data provided by the Environmental Agency of the Republic of Slovenia. However, none of the data show a substantial increase or decrease of the quantity of generated municipal waste in Slovenia in the last years. The trend in municipal waste generation is rising in the majority of EU Member States. The Fifth Environmental Action Programme set out a goal of stabilising the municipal waste generation across the EU at 300 kg/capita per annum by 2000; however, this goal proved to be difficult to reach – in 2004, the average quantity in the EU was around 530 kg/capita per annum. The Ministry of the Environment and Spatial Planning - Environmental Agency of the Republic of Slovenia has been monitoring the generation of municipal waste since 2001. In accordance with the Order on the management of separately collected fractions in the public service of urban waste management (Official Gazette of the Republic of Slovenia no. 21/01), the providers of public service of municipal waste collection report on the quantity of collected waste annually (31st March) to the Environmental Agency of the Republic of Slovenia on special forms. The content of each submitted form is checked. If it contains irregularities, the data are synchronised together with the contractor. The reports are entered into a database. The data on the collected quantities are used as a basis for calculating the quantity of generated municipal waste. The number of inhabitants used for calculating the indicator is taken from the Statistical Yearbook (the data in December for the current year). 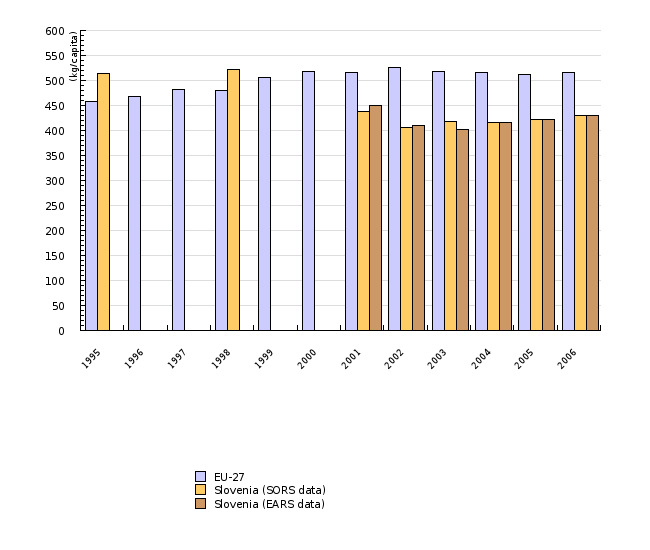 The generation of municipal waste is also monitored by the Statistical Office of the Republic of Slovenia, which publishes the data in the SI-STAT web database (February 2007). The data for the EU-27 (Municipal waste generated) were taken from Eurostat in February 2007.